Ah, yes. The somewhat Japanesey-Ogres have finally made their debut! I’d be a lying if I didn’t admit that I’ve been waiting for this moment for a while now. As someone who dove real hard into the source material after requiring more Tenshura, this moment in the source was something I was dying to see how the anime would adapt. 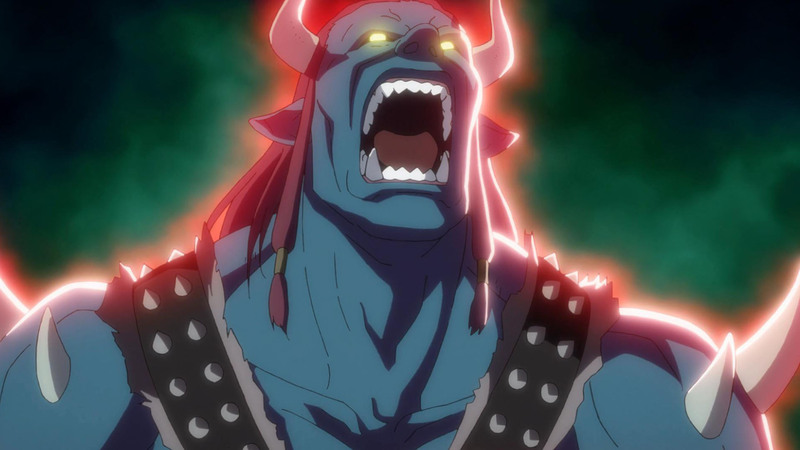 Because as much as I love to see Rimuru showing off his excessive power, I was curious to see how the show would handle the somewhat hot-tempered Ogres. Seeing how they’re obviously inspired by the Ogres of Japanese lore, it was really fun to see the plot embrace that entirely and just run with it — especially when it came to the lead Orge donning red armor. 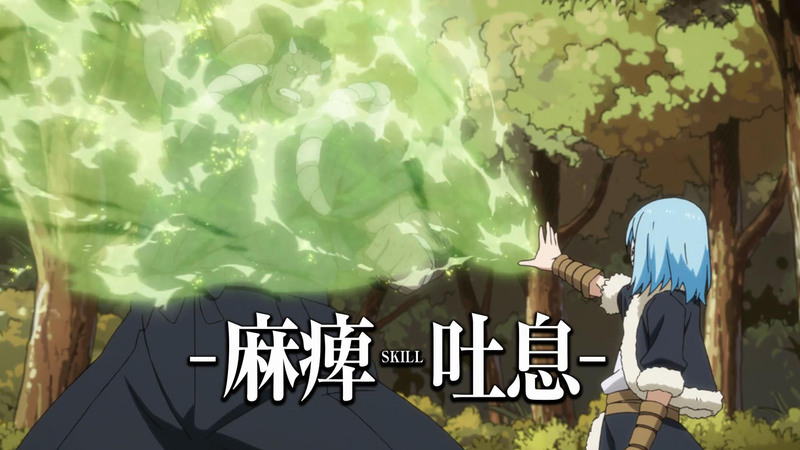 The reason why I enjoyed it so much though was it’s always fun to see someone challenging Rimuru, especially if they’re able to keep him on his toes. Luckily, the Ogre Princess was able to speak up and knock some sense into all of her comrades before Rimuru had to do something a bit more serious. 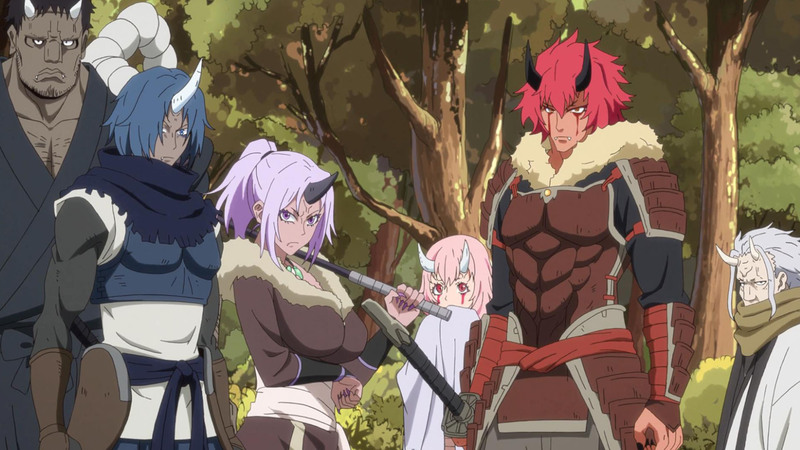 A feat that I think complimented the personalities of the other Ogres well since it pretty efficiently communicated that the group facing Rimuru were capable of much more than just violently rushing at people. Besides that, there wasn’t really all that much that happened throughout this week’s episode. 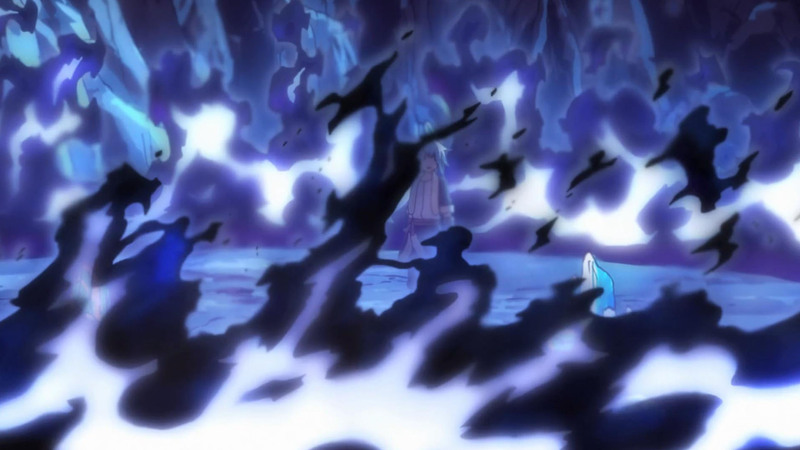 Minus some fun antics with Rimuru playing around with some of his new powers (I might be in the minority, but I think I prefer seeing him in his Slime form), this was plain and simple a nice setup episode for the things to come. 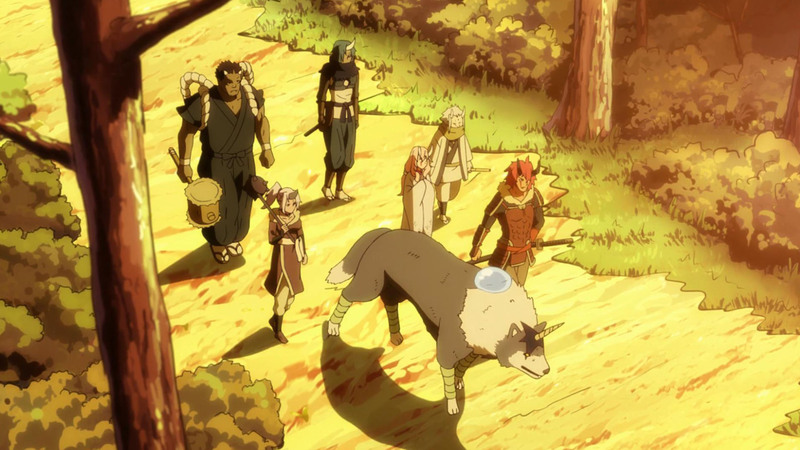 Hopefully we’ll be able to find out just who and what it was that ravaged the Ogres’ village since it looks like whatever is causing trouble out there might be rearing their heard toward Rimuru eventually. In any case, I’ll catch you guys next week. See you then! The actual structure of this show is amazing, and does go to show the author’s civil construction experience. Everything is like a widening spiral, where Rimiru generally isn’t out looking to make a huge impact on the world, but his expanding sense of responsibility means that has the ever growing area of influence he is involved in gets wider, he gets pulled into greater and greater events. Our poor slime just wants to have some basic security for his folks and maybe enjoy the company of some buxom elves – instead he’s trapped in an ever widening whirlwind that is gonna sweep across the forest and the world… or so he says. While I agree the structure is a seller, I’ve always admired the tone more. It’s really hard to have characters so comical and lovable and still have real emotion. 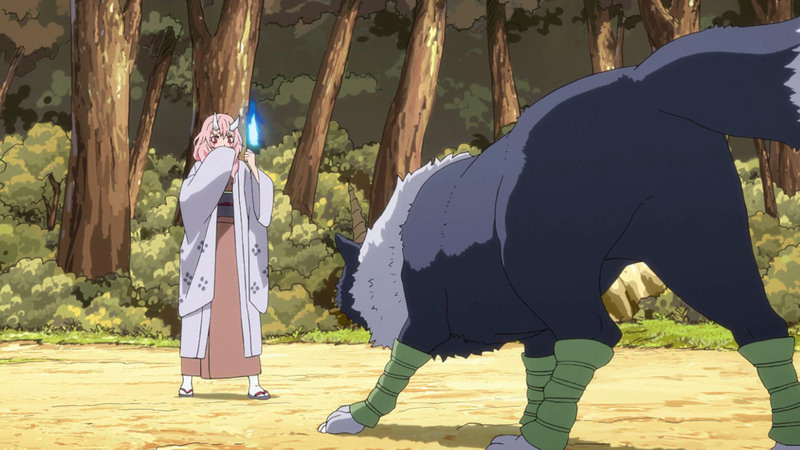 It helps that Rimuru is OP, but there are plenty of series out there where an OP MC tries to be funny and it either just make it impossible to take anything seriously in the series or the comedy clashes with the rest of the show. Here, though, it just works with everything. 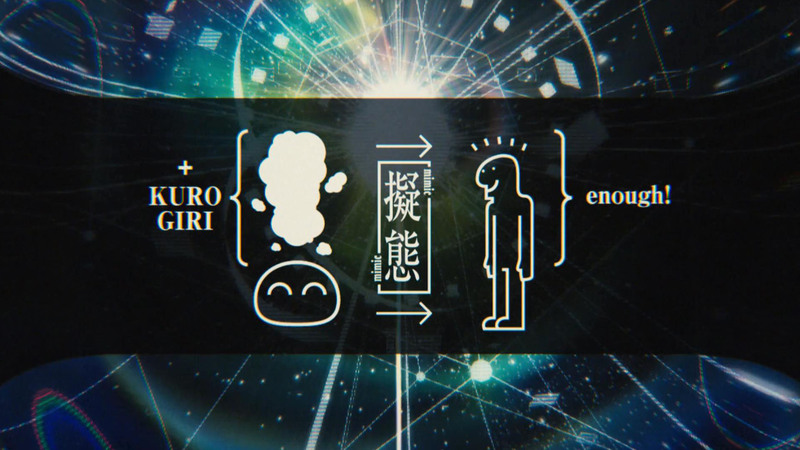 I’m not sure if it’s how willing Rimuru is to make fun of himself or what, but I love it. 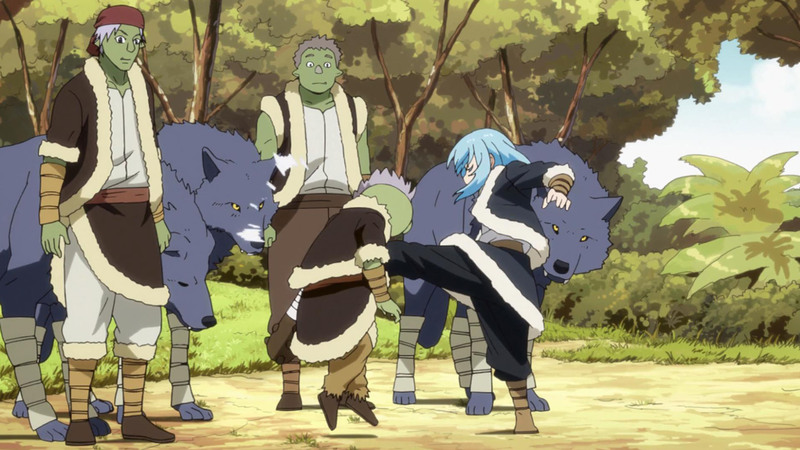 If I didn’t know the story I’d have been worried about the goblins when they clashed with the ogres and left wondering how Rimuru would resolve things. Plus, he still screws up with reading people, and that’s good! Gives him more character. Definitely the tone. That combination of comedy, good feelings, action and emotion is perfect. 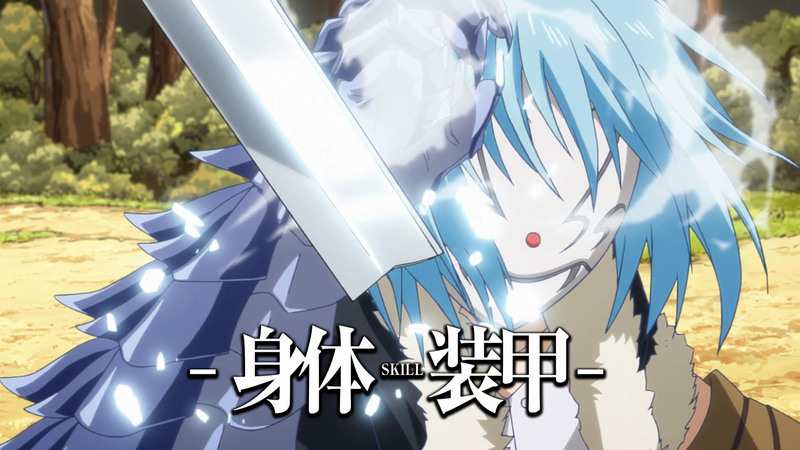 -The series allows other characters to have their own moments, even if Rimuru is there to save the day in the end. They struggle, they suffer, and you worry or cheer for them. 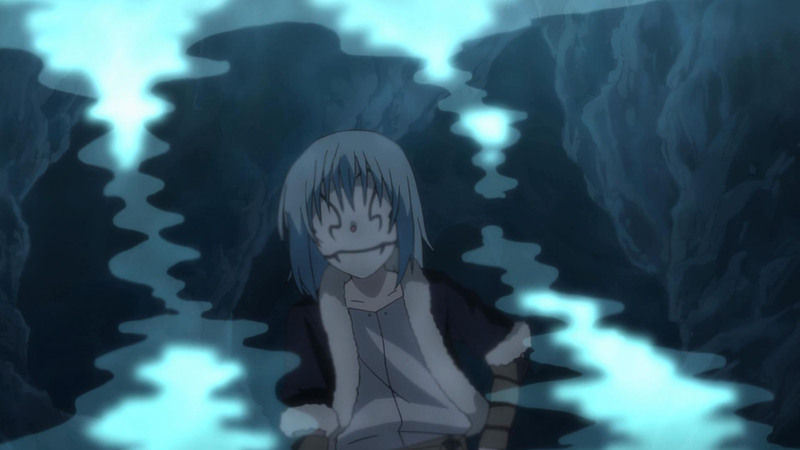 -Rimuru can’t always solve conflicts with brute force. 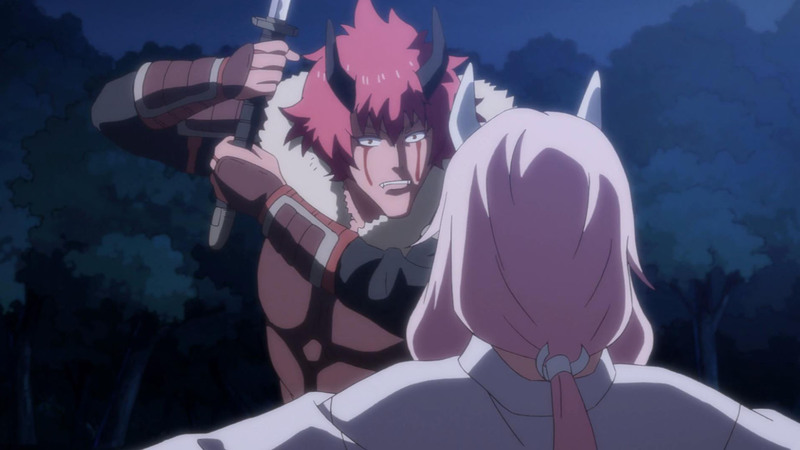 This episode was a good example: Rimuru could have beaten the Ogres easily, but his real goal was to make them see reason and stop fighting on their own. In the end, it wasn’t him but the Ogre princess who did it. Similar things happened with the dwarves (he could have evaded capture or prison, but that wouldn’t have given him the engineers he needed) and Shizu (defeating Ifrit didn’t save her in the end). 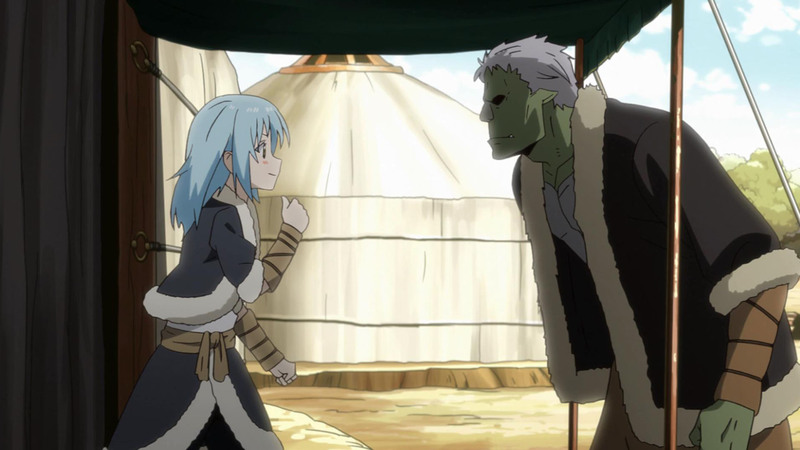 Looking forward to the spinoff where Priestess picks up Rimuru thinking he’s a tame slime pet, while Rimuru tries to confront GS for daring to go after his goblin people. oh, this is priceless. thank you for sharing. 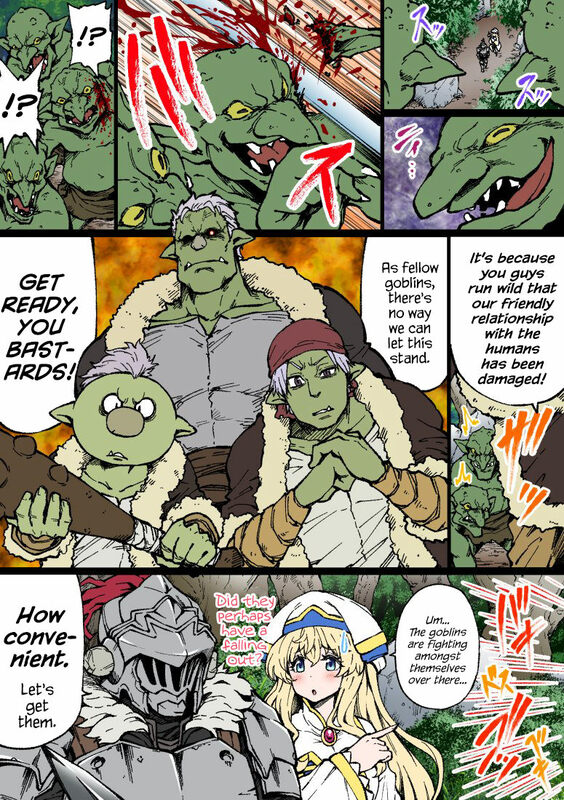 I am sure Goblin Slayer will faint if he sees “Good” goblins. 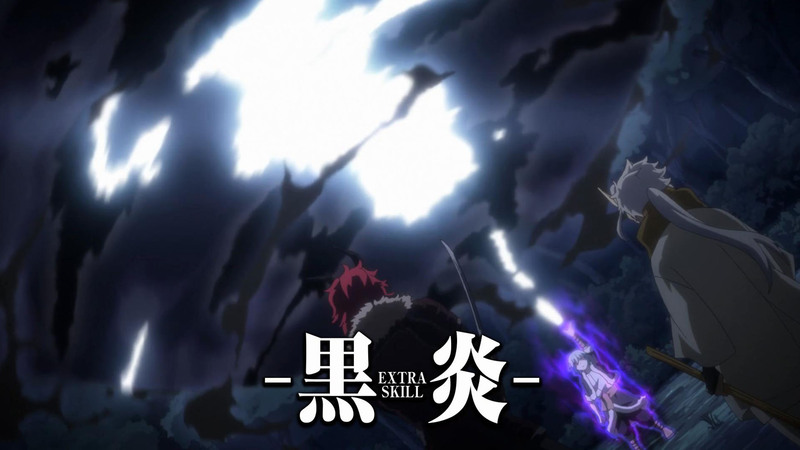 Is there a fan-made version for Goblin Slayer and Overlord? I recall seeing “good” goblins there. A good goblin is one that never crawled out of the goblin hole. I see something that I rarely see in most heroines. 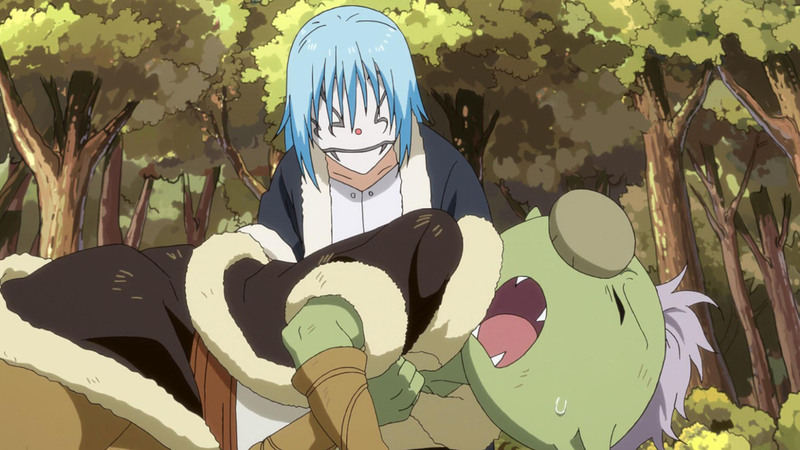 And of course it’s in a series where poor Rimuru is lacking “equipment”… well, they’ll still make for good seating cushions. Was it because he was still an Virgin with his 37 Years old? then what about me? I am Grand Guildmaster? Poor guy, he lacks “something.” I still wonder if he can crossbreed with female creatures? Anyway, that big chested girl looks hot. I should look for more anime with characters that resemble her. Are there any anime with big chested heroines? Most big chested girls are often “childhood friends” that get heartbroken in the end T_T. Looking for an anime that is the opposite of Fuuka. I really like the Ogres design. Remove the horns and they look like they can be from Naruto universe. 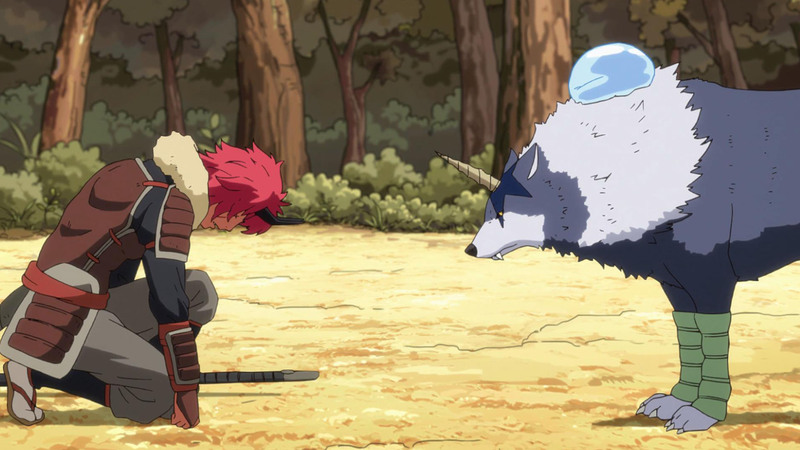 Since the OP and ED already spoiled some plot points, I’m sure you will know what happens next to the Ogres. Loli-slime is best slime! @Takaii – yup, you’re in the minority. but I got the gist of it anyway) when he transforms into a human form. (where have I seen those characterizations before – they look familiar). beginning ’cause my brain was expecting a voice like Shizu’s. Gobuta is definitely 1 of my fav character and his oppai joke this ep with Rimuru LOL. Can’t help notice that Rimiru counted 6 and he/she was sighing. I think he/she was expecting 7. See. ….. ANY other studio would’ve just skipped the past 8 episodes and just started the show with THESE turn of events, since it features most of the cast on display on all the marketing. You would be SO lost as to what happened beforehand if we didn’t get that long prologue. I was weirded out by the slow pacing, but now I understand why it had to be there. At the end of the episode one of the ogres says they don’t have names, and immediately I rolled my fckin eyes because I knew EXACTLY where they were going. Can no other creature do it to other nameless ones? Why can HE? This Mana Generator.. is it the Dragon he eat? Giving a monster a name requires such a vast amount of magicules that the average monster would be seriously hurt by the ritual – in many cases, the depletion is so bad that the giver would never recover. It’s basically a case of completely depleting its MP and then sacrificing both its maximum MP bar and its HP as well to provide enough power. Thus, while most monsters COULD name another monster, the cost is so high (and the benefit often low due to the inherent weakness of the namer) that they don’t bother. Monsters don’t need names to operate, after all. 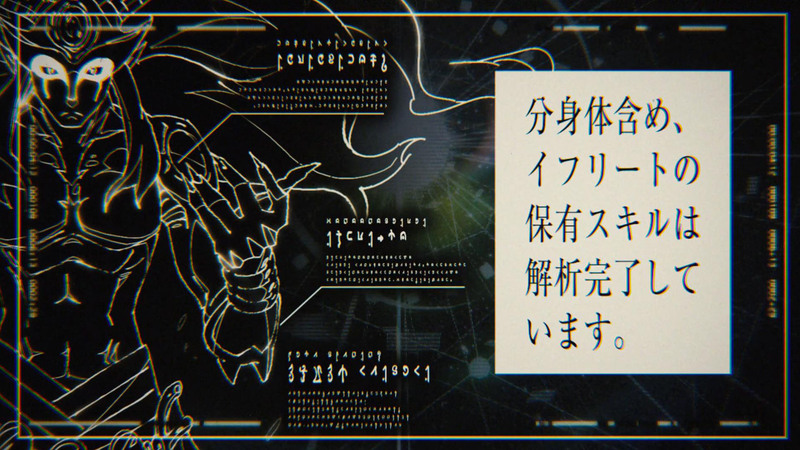 one thing that is presented in the Light Novel is that Rimiru is doing more than just providing a name – because he’s eaten Veldora and is using the dragon’s magic, he’s also bestowing Veldora’s blessing upon the monsters he names as well. So every monster who Rimiru names has the added benefit ‘Blessing of the Storm (Dragon)’ added to their stats, which greatly improves their abilities beyond what the actual name would bestow. This is part of why Shizu ended up with the ability to bond with Ifrit is that Leon bestowed a name and his own Demon Lord’s Blessing upon her, so she was able to bond with Ifrit and survive. Thanks bro. Your explanation is clear and precise. And this is where my confusion lies. This is a game mechanic that is wildly original and useful, but the fantasy world in this anime is NOT from a game! So what’s the deal?? You do know MP/HP are just representations of what would be magic power and your physical state of existence. So fantasy settings even if they don’t display HP/MP it essentially exists. I don’t really understand why your confused by a mechanic that they explained right in the first episode. Games try to model a setting and just because a fantasy setting isn’t from a game doesn’t mean it can’t have things that could easily be represented in a game. It is confusing/illogical to claim that because it isn’t from a game it can’t have any rules/features that might exist in a game. I’m kinda assuming this is a reference to the fact that infantasy games there are often millions of “goblins” but the of you see one named Bob you’d best be prepared…. 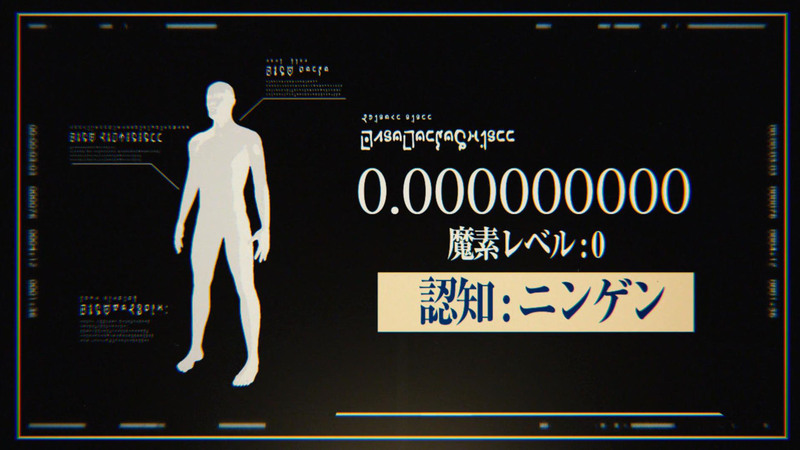 Well it actually is more like in fiction named characters tend to be much more important than 1000′s of unnamed mooks. So it really isn’t exclusive to games. Games are works of fiction and in fiction named characters are more important generally stronger. So in Slime’s world that is taken to the logical extreme where being named makes you stronger. But even if the human shape is to be expected, I’m a bit disappointed by the one he got. A sexless child? 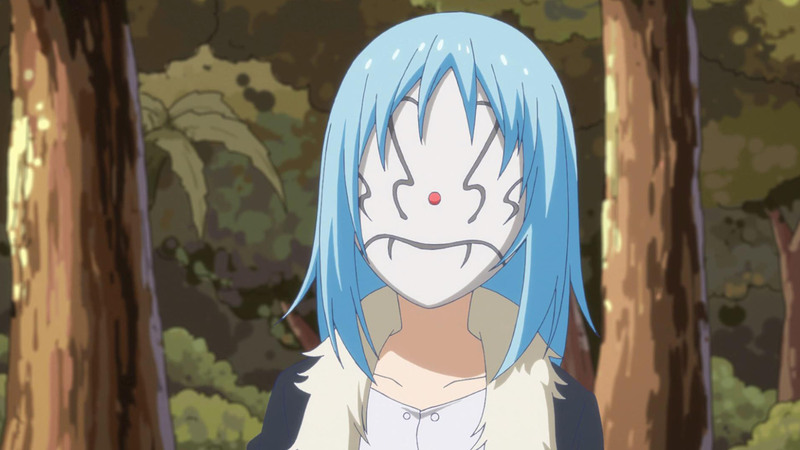 I understand that androgynous and cute characters are popular in Japanese media, and they probably wanted to keep that “cheerful, harmless, innocent” vibe of his slime form, but… I don’t know. Personally, I think it would have been more interesting if he got a complete female body like Shizu’s. It would be too easy to play his discomfort for laughs and/or fanservice, and justify why he wants to stick to his slime form unless there is no other option. November 28, 2018 at 11:45 pmDorian S.
Actually, if you think about it. 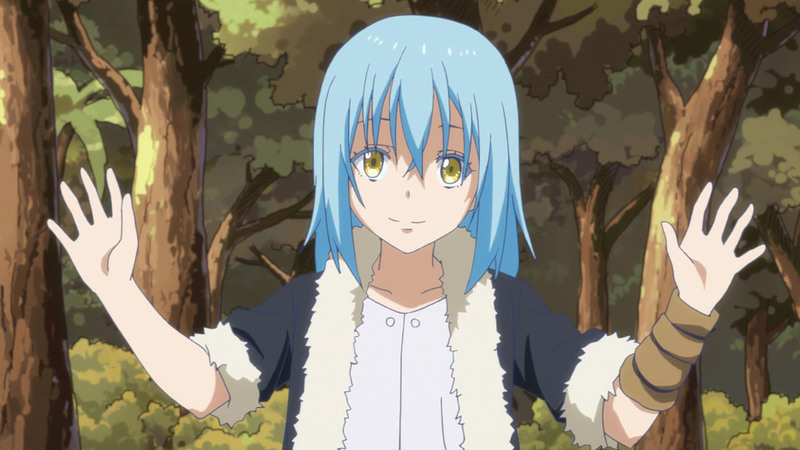 Rimuru is likely a young child for a slime. 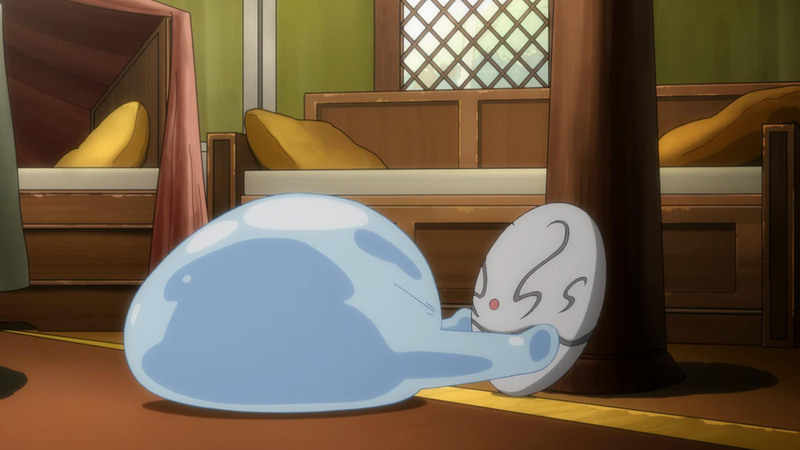 Remember, he was reincarnated as a slime that probably, normally, don’t live very long. So that’s probably why he’s so small when he first materializes his human form. Also why he isn’t like a baby, but a young child. …to put it another way, think of slimes as pets. If you think of him as like a cat, he would live like 10-20 years. That’s probably being generous for a slime’s life expectancy, but let’s roll with it. 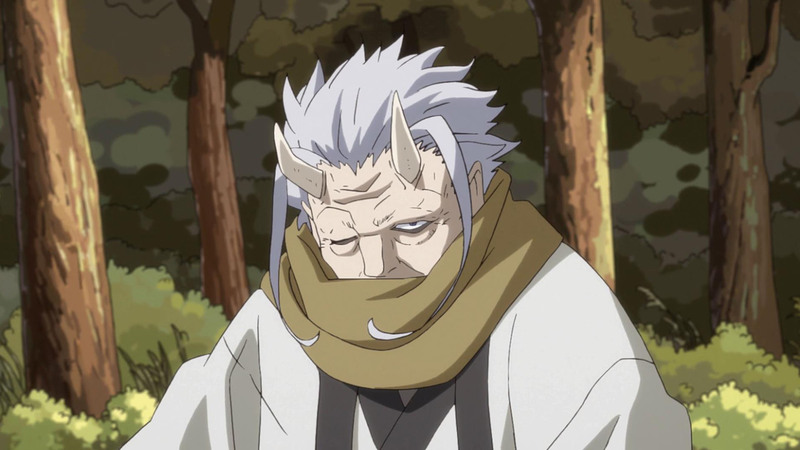 When he’s inspecting those forms, his reincarnated self was thinking how he’d look as an adult because that’s what his reincarnated self would think he should look like. In truth, he’s probably in his male form right now and like you’d barely get a small difference for his female form, as his slime body is just a child’s still. Or at least that’s how I’m thinking about this. There’s nothing that says this outright, but that’s kind of what I figure about it. Also explains the voice on why it sounds more kiddish now than when he was a human. 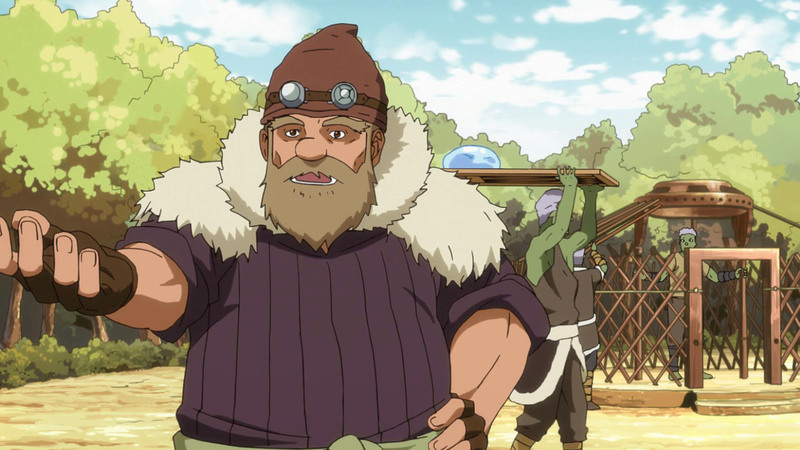 Absolutely just loving this show and these new Orge characters are going to be a nice addition to slimes growing United Nations. I too am apart of the minority that prefers slime in its slime form. I have gotten so used to it that way that this human form thing doesn’t gel for me. Good episode. So short! 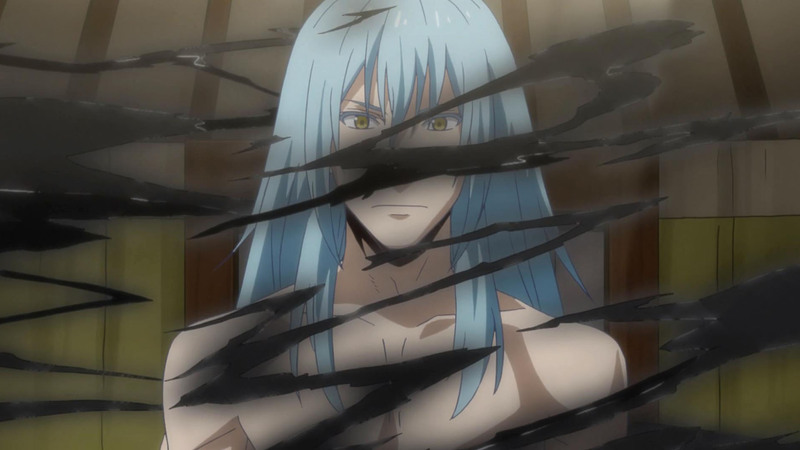 I was amused as hell to see Rimuru play with his new human body, and his (I will stick to the foremr life gender) mild disappointment at being sexless regardless of form he choses to use. Ogres look like fun bunch, closely mirroring the retinue of Japanese feudal lord (show, and I presume the source also really went to great lengths to undersocre their Japanese style, down to weapons and speak mannerism). Can’t wait for them to get named by Rimuru, since they certainly deserve names of their own. 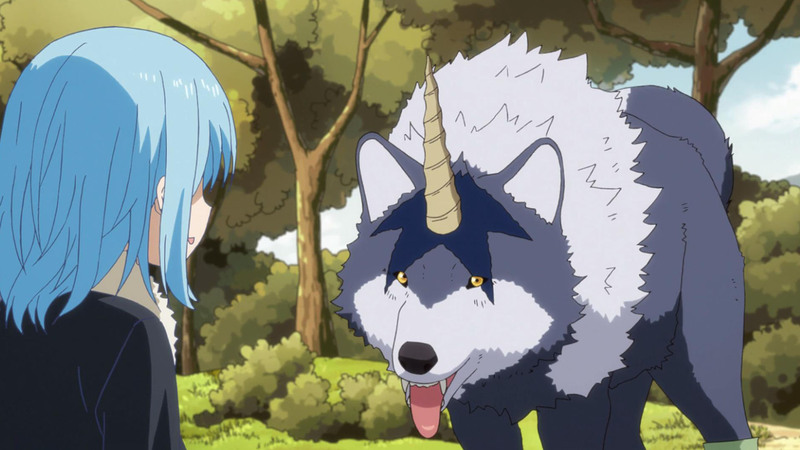 Also again I loved how Rimuru’s common sense and amiable disposition won thru even famously bad-tempered Ogres. 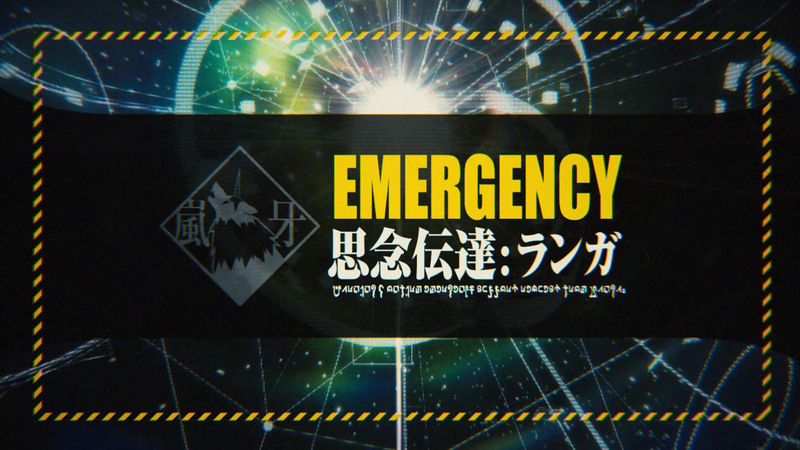 Probably not a news anymore, but the latest PV just came out few days ago. Looks awesome and exciting if you ask me. 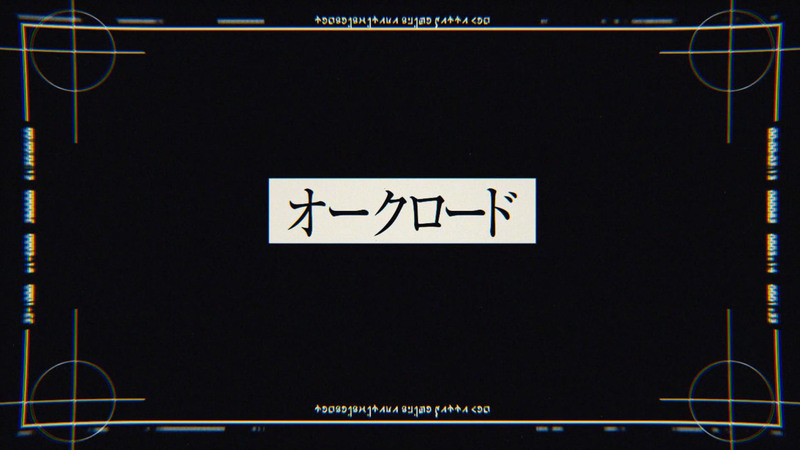 Yeah, anime-only people definitely shouldn’t look at this, it’s got a huge amount of footage vaguely summarizing the direction the plot takes. 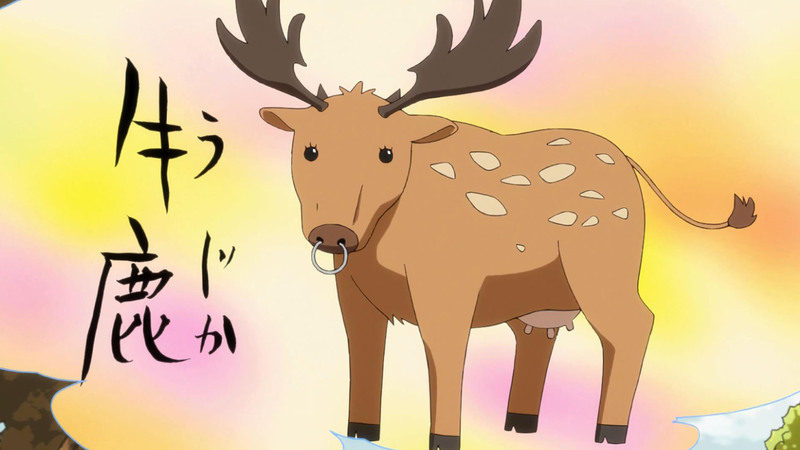 When you have cattle this cute, it is difficult to salutter the Anime for food. 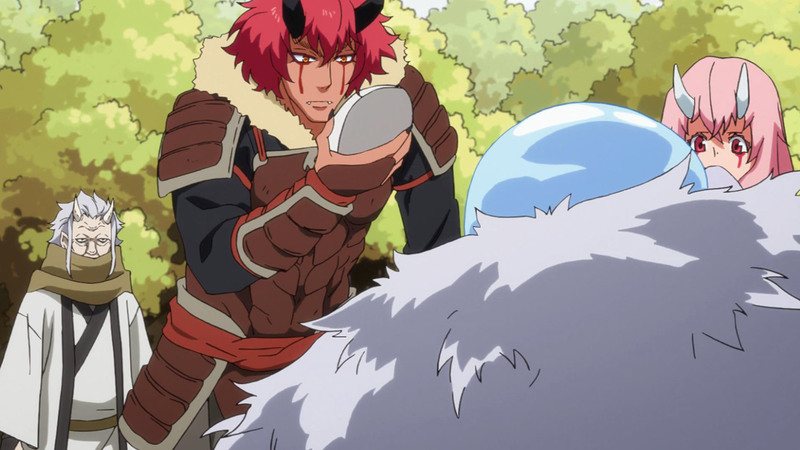 The ogres are awesome, but the plot structure of this anime is kind of a mess. Rimuru talks grandly about ‘inheriting Shizu’s will’ and all… and then he goes back to building houses? I’m not saying he should have run off after the Demon Lord, but… it’d be nice if he showed any intention of actually following through there? 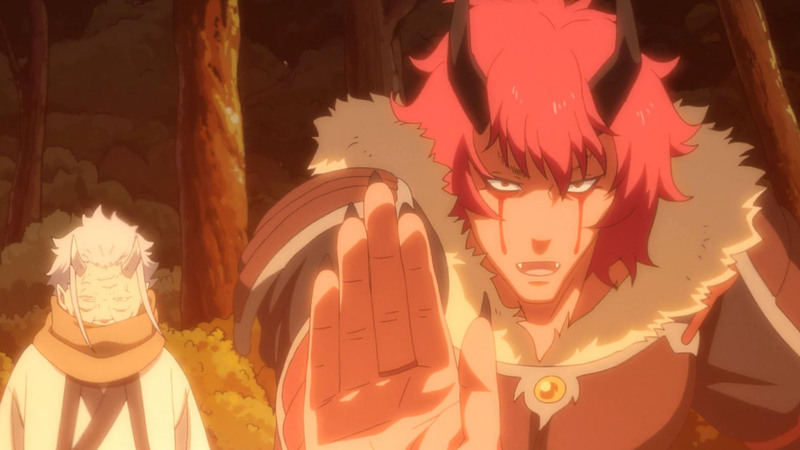 Asking people about the Demon Lord, something, anything. If anything I’d argue that makes him more responsible than the average Isekai MC. Jura Forest isn’t stable right now thanks to Veldora and Rimuru pulling off a jail-break, as we saw when hundreds of other goblins came flocking to Rimuru and Co. for protection. Rimuru knows he’s partly responsible for the situation, which was part of why he saved the goblins from the direwolves in the first place. Even evolved, hobgoblins are still only around the middle compared to the rest of the things in the forest, so it’s possible that if he left to look into Shizu’s past he might come back to find everyone dead. They need a town and weapons to defend themselves with. And who is he going to ask, anyway? They don’t exactly get a lot of traffic in a place that until recently was known for Veldora and nothing else, he can’t go back to Dwargon, and this isn’t exactly a great time to introduce themselves to someone entirely new. It’s not like he has a reason to rush, either. He’s just waiting so that when he starts getting involved he can really commit. 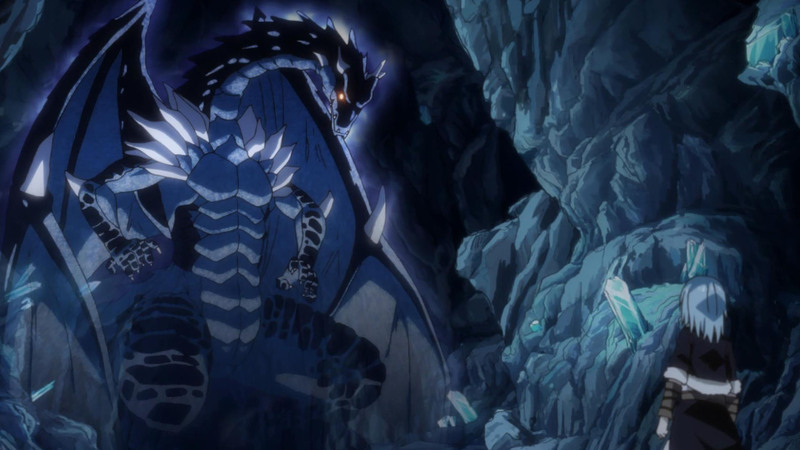 *shrug* People knew things he didn’t about Veldora Storm Dragon, presumably the actual Demon Lord is an equally iconic figure. Even if all he got was myth and rumor, that would feel like he was trying to do SOMETHING. It’s still in development, but it’s pretty robust.